PROMO: Alita: Battle Angel "Win Premium Items"
A 20th Century Fox feature film, Alita: Battle Angel will open February 6, 2019 in PH cinemas to be distributed by Warner Bros.
Join the promo and get a chance to be one of the ten (10) lucky winners who will win premium ALITA: BATTLE ANGEL items. Get a chance to win one of the Premium ALITA: BATTLE ANGEL Items. - Seven (7) winners of Premium ALITA: BATTLE ANGEL Items will be chosen on the given dates above. Participants must like the official PinoyExchange Facebook page. Get a chance to win one of the three (3) Premium ALITA: BATTLE ANGEL Items. - Three (3) winners of Premium ALITA: BATTLE ANGEL Items will be chosen on the given dates above. Prizes: Get a chance to be one of the ten (10) lucky winners who will win one (1) of exclusive ALITA: BATTLE ANGEL premium items. Employees of PEx Online Communities Corp., Warner Bros. and its third party partners up to second degree of consanguinity are not qualified to join the promo. Participants not eligible to join the promo such as employees of PEx Online Communities Corp., Warner Bros., and its third party partners up to second degree of consanguinity will be disqualified. Get a chance to be one of the ten (10) lucky winners who will win one (1) of exclusive ALITA: BATTLE ANGEL premium items. Answer and get a chance to win one of ten (10) of ALITA: BATTLE ANGEL premium items! 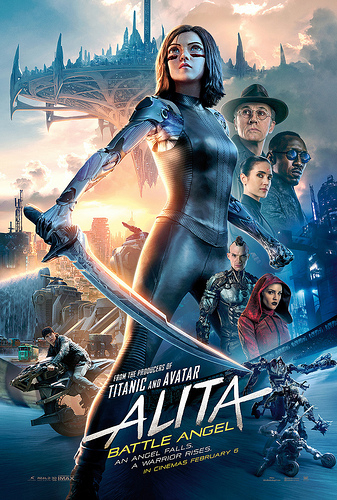 Name the fictional 26th century metropolis where the ground-breaking, cinematic action adventure ALITA is set? Seven (7) winners in Promo Question 1 will be selected on February 25, 2019.